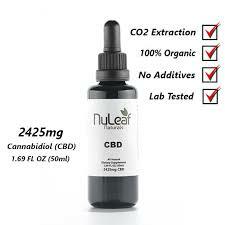 Nuleaf Naturals is now selling a Full Spectrum CBD Oil containing 2425 mg of cannabinoids. It is specifically made to meet the consumer’s needs. Helps treats epilepsy/seizures: It has been suggested that CBD medication can be used with Dravet syndrome, a rare type of epilepsy which is often induced by fever, causing a significant drop in the frequency of seizures the patient experiences. Cannabidiol helps to control seizures by attaching to the brain cells that are responsible for regulating relaxation, calming the firing of neurons in the brain. May prevent Alzheimer’s disease: Research has shown that the effects of CBD oils may slow the progression of Alzheimer’s disease. The active compounds in CBD oils slow the establishment of amyloid plaques by blocking the enzymes in the brain which make them. Amyloid plaques kill brain cells, ultimately cause Alzheimer’s disease, which is why it’s important to prevent them. Relieves stress and anxiety: The most common uses of cannabinoids are reducing stress and calming someone. They are mostly used by people who experience anxiety. The natural compounds found in the 2425 mg Full Spectrum CBD Oil – Hemp Extract are effective for releasing relaxing the mind, releasing pleasure hormones and reducing stress, inducing a sense of calmness and relaxation. Pain relief: CBD oil is a celebrated analgesic (painkiller). Researchers have found that CBD interacts with receptors in the brain and the immune system to reduce inflammation and alleviate different types of pain. It more common to relieve chronic headaches, back aches, joint pains and may even relieve you from cramps. Quality: This is a 100% organic full spectrum CBD Oil. No preservatives, additives or even pesticides are used in its production. Its purity is maintained by using CO2 extraction methods and has been lab tested severally to ensure it doesn’t have negative side effects. Effects: The two major components of this 2425 mg Full Spectrum CBD Oil are cannabidiol and tetrahydrocannabinol. CBD impacts the brain without getting high, and tetrahydrocannabinol, also known as THC, has pain relieving properties, making this product the best for pain relief. It is also very effective in handling other medical concerns. Price: Should you be looking for a 2425mg Full Spectrum CBD Oil for sale, you can visit the official NuLeaf Naturals website to get this product. You can also easily click on https://hempworldstore.com/nuleaf-naturals-brand-review/ to get the product for the very affordable price of only $239. Final thoughts: You don’t have to use chemically prepared, over-the-counter drugs to treat yourself for ailments such as pain, anxiety, stress, etc. Nuleaf Naturals strive to only deliver the best products in their most pure, simplest forms.